Ruby Walsh is set to return to action over the Easter weekend following a month's absence through injury. 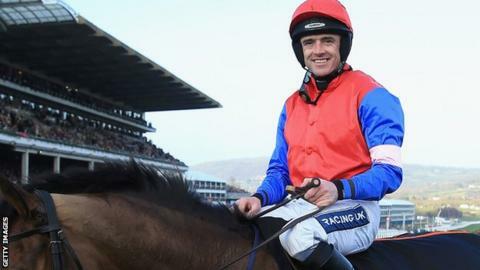 The Irish jockey, 34, dislocated his shoulder and fractured his humerus in a fall at Cheltenham in March. He missed the Grand National and was thought be in danger of missing the rest of the season, but after seeing a specialist he plans to have more surgery later in the year. Walsh told Racing UK he would be racing again "at the weekend". Walsh fell while riding Abbyssial in the JCB Triumph Hurdle at the Cheltenham Festival, and was then hit by Adriana Des Mottes. He underwent surgery and his participation in the Punchestown Festival, which begins on 29 April, looked unlikely. "I will have to have an operation, but I won't have to have it until later in the summer," Walsh added. "The doctors are happy with it and if they're happy with it, I'm more than happy. I'll probably be fitter going to Punchestown than I was going to Cheltenham - if the physio has his way! "I thought I'd be out for quite a bit longer, so to find out then I might make Punchestown has made the time shorter than I thought it would be."